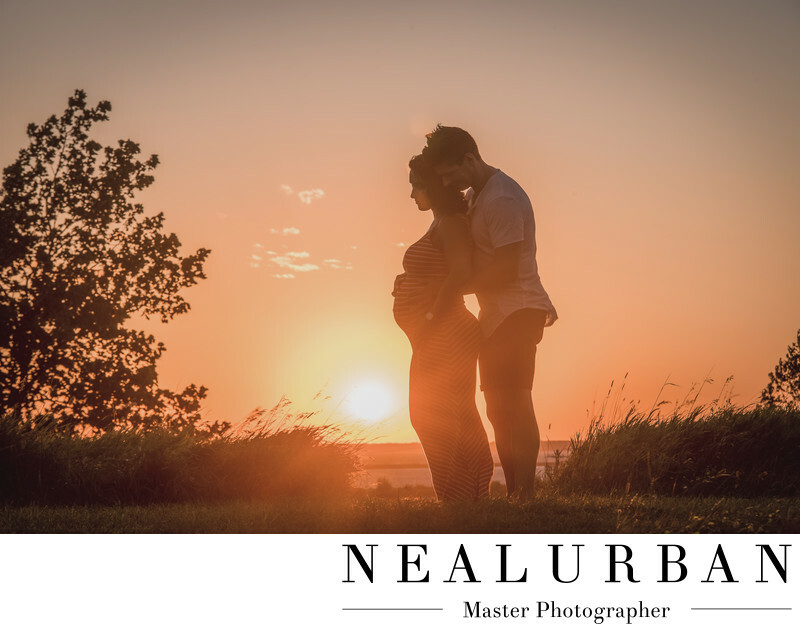 Natalie and Joe had their maternity session at Tift Nature Preserve in Buffalo. This is a beautiful location for photos. We started off their session at the Outer Harbor. Natalie's sister, who was also pregnant, joined us for some photos. That was so much fun! Then we headed over to Tift for more photos with Natalie and Joe! We got here a little before sunset. We loved the gently rolling hills and the natural back drops. The hills have paths, so it was pretty easy for mommy to be to navigate. Natalie's dress was very fitted so show off the baby bump. She was pretty tiny, so this was great! The sun was setting and the colors were starting to look amazing! We do get some great sunsets in Buffalo. They can be so vibrant. We really wanted those colors to stand out, so we decided to do some silhouette images. I love this! This image is not one hundred percent silhouette. You can still see some soft features on Natalie and Joe. Prom pose and maternity session go hand in hand. We had Joe stand behind his wife and place his hands on the baby bump. Then Natalie intertwine hers. Then they both looked down toward the baby. They were having a baby boy and super excited! There was an opening in the tall grass at this spot. It was a direct path to having the sun behind them! We really liked how the wind was blowing the tall grass around. It also kept Natalie and Joe cooled off. It was hot day for their session! We also had the honor of photographing their wedding a few years before. Then the newborn and first birthday cake smash when their son arrived! Location: 1200 Furhmann Blvd. Buffalo NY 14203.